Villa Liquidámbar is a typical farmhouse of the nineteenth century of the Sierra de Los Cameros, in La Rioja, Spain. The rural house is divided into Villa Liquidámbar I and Villa Liquidámbar II, two houses, two different rooms. Our house is ecological, maintains in its facade the knowledge and the charm of the typical constructions of this area; river ridge, tufa stone and ashlar and wood in entrance gates, windows and beams seen from the interior. The heat of the home is provided by a biomass boiler that respects the environment. We welcome you with a gift of the typical craftsmanship of the area, wood for the chimneys and coal for the barbecue. Low level; a wide room of 100 m2 of stone walls where tradition, natural warmth and comfort merge. A large living-dining room-kitchen in a single space to enjoy warm moments in family and friendship around the fireplace. This floor also has a full bathroom with shower and a large entrance portal. First floor; five rooms where tradition, color and light invade each of them. Two bathrooms, one complete with bathtub and the other with shower. The furniture is rustic, restored by us and is original of this area. Second floor; There are three rooms-suites with living room, TV and individual bathroom, each room can accommodate four people. A fully equipped kitchen-dining room. Third floor; what in this land is called "la solana", is the reading, music and relaxation room, with the charm and warmth of the wood and wonderful views of Mount Serradero and the town of Torrecilla. A French stove accompanies the warm evenings of the lounge. In front of the house runs a channel without risks where the children are transformed into pirates of the Iregua. We also have next to the entrance, a playground and parking for cars. We admit pets and we have maximum coverage wifi. 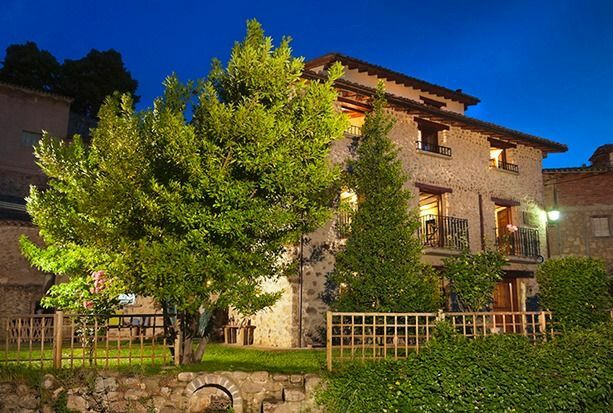 Villa Liquidambar I, has a large garden with barbecue. Torrecilla en Cameros is located just 20 km from the capital of La Rioja, Logroño, a stone's throw from the wine-growing area of ​​this community and less than an hour from the cradle of Spanish, Monasterios de Santo Domingo de la Calzada. Fuimos un grupo de 11 personas un fin de semana de marzo y fue estupendo. La casa es preciosa y muy cómoda. Tiene un magnífico salón donde pudimos cenar cómodamente un montón de gente. A pesar de ser un fin de semana bastante frío, la casa estaba super calentita. No le faltó ningún detalle. Desde luego pensamos repetir. Gracias a Paloma y Joaquín, los dueños, que son encantadores! En cuanto a Torrecilla se refiere me gusto mucho,me falto tiempo para poder descubrir mas sitios y disfrutar de su paz,calidad de aire y toda su naturaleza en estado puro.Y en lo referente a la casa rural Villa Liquidambar solo puedo tener palabras de agradecimiento para Paloma y Joaquin por el excelente trato que me dieron,la casa es una maravilla,muy acogedora,limpia, organizada, con una decoración muy chula,las habitaciones amplias,equipadas con todo lo necesario y algo que me apetece resaltar es la gran comodidad de la cama,el mejor colchón posiblemente en el que he dormido.En definitiva Villa Liquidambar es altamente recomendable sin lugar a dudas,en mi opinión hay que descubrirla. Hemos pasado en familia 4 noches en Villa Liquidambar II, una preciosa casita inaugurada hace un año, que nos ha encantado. Decoración moderna pero bien integrada en una construcción de piedra al estilo de la zona. Limpieza impecable; con el equipamiento necesario y en buenas condiciones. La recomendamos como enclave perfecto para visitar la sierra de Cameros, que para nosotros ha sido un grato descubrimiento. Y sobre La Rioja, ya está todo dicho, siempre nos gusta volver.